Simplify your guests’ experience by adding handcrafted signposts to the scene. 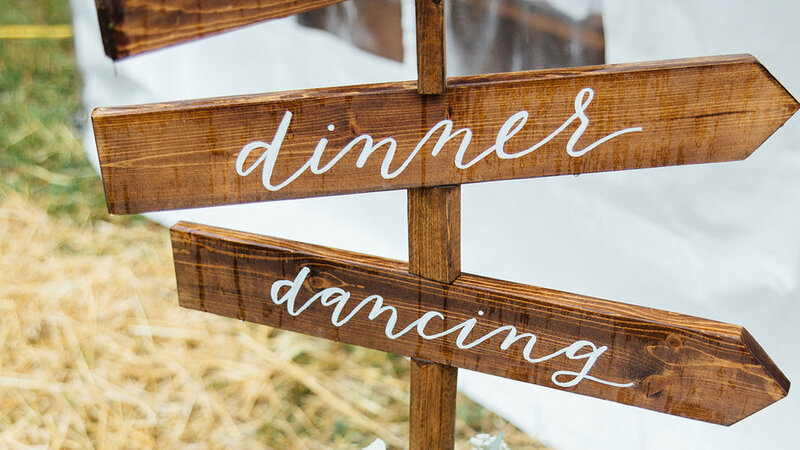 These decorative markers effortlessly add an attractive, rustic touch while helping guests find their way to dinner, drinks, and the dance floor. 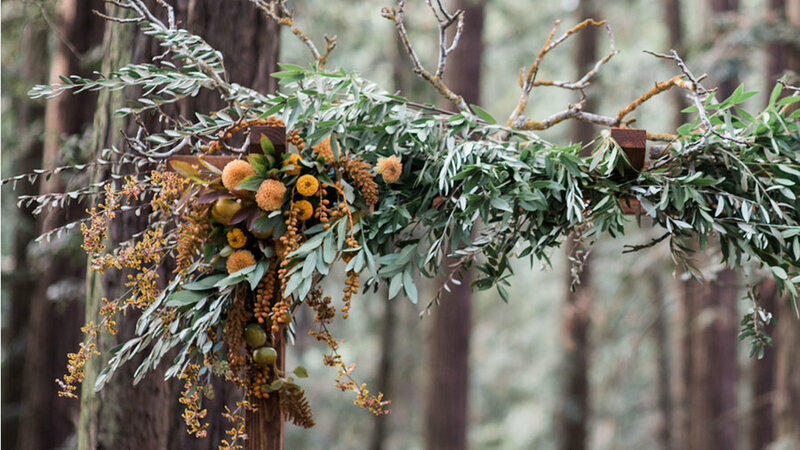 Take inspiration from this Montana wedding by stringing ferns, ‘Baby’s Breath’ (Gypsophila paniculata), and eucalyptus to the base. 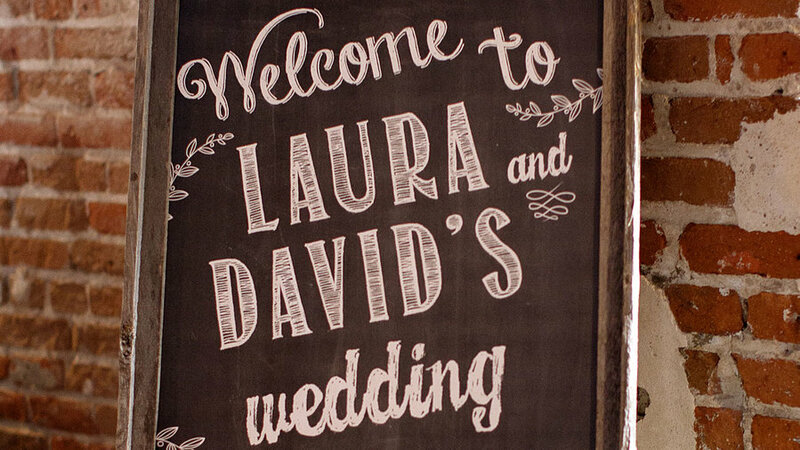 Greet guests in style with a framed, personalized chalkboard. Accented with beautiful typography and clusters of baby blossoms, this decorative piece sets the tone for the wedding ahead and can easily be customized with little details that represent you. Looking for the memories of a photo booth without the technology or price tag? 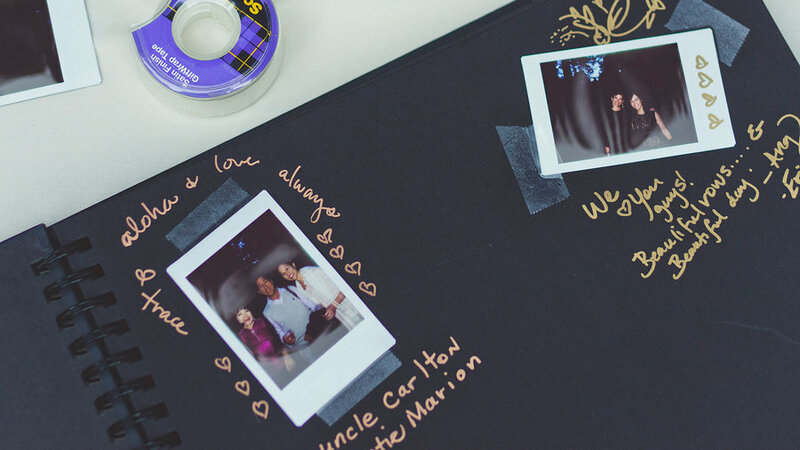 Capture the moment with a DIY photo station. Pair a Polaroid camera alongside a blank photo album where guests can snap their smiling faces and craft personalized messages for the bride and groom. Keep the rustic theme going with this wired, wooden frame. 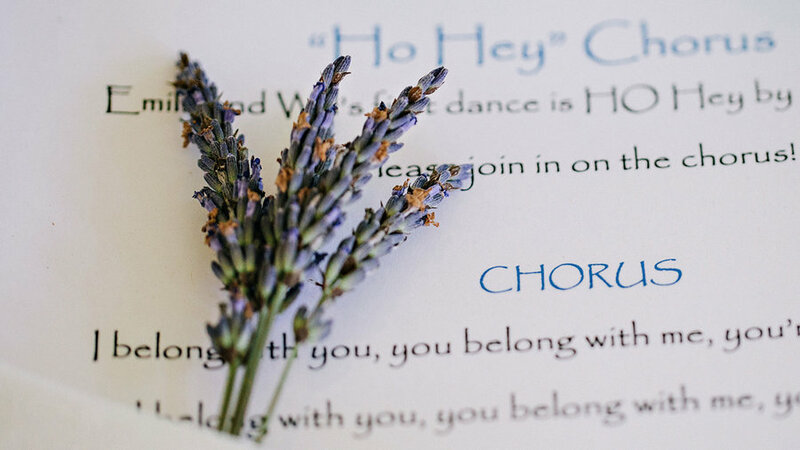 Set out bits of paper and colorful pens, and invite guests to cite their best advice for the happy couple. Soon you’ll have a collage of blessings hanging from clothespins. 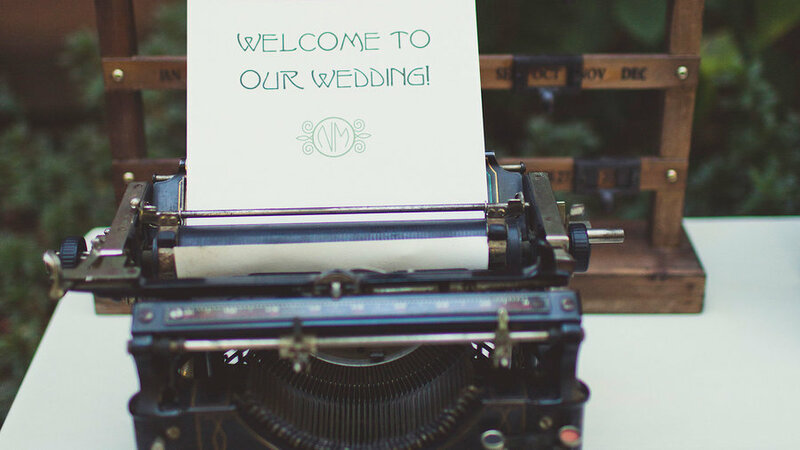 Add a bit of retro chic with a typewriter guest book. 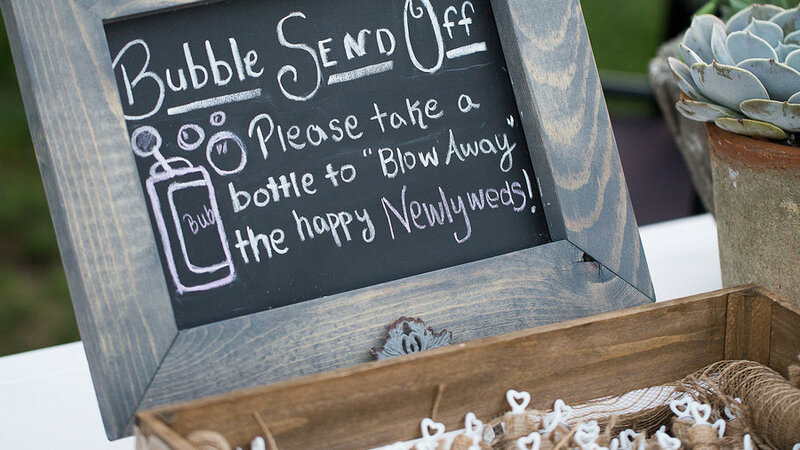 This concept adds an interactive element to the reception’s entry as guests type their well-wishes to the happy couple. If you’re looking for more of a stylish accent piece, then simply follow suit by showcasing a piece of cardstock with welcoming words in your favorite typography. 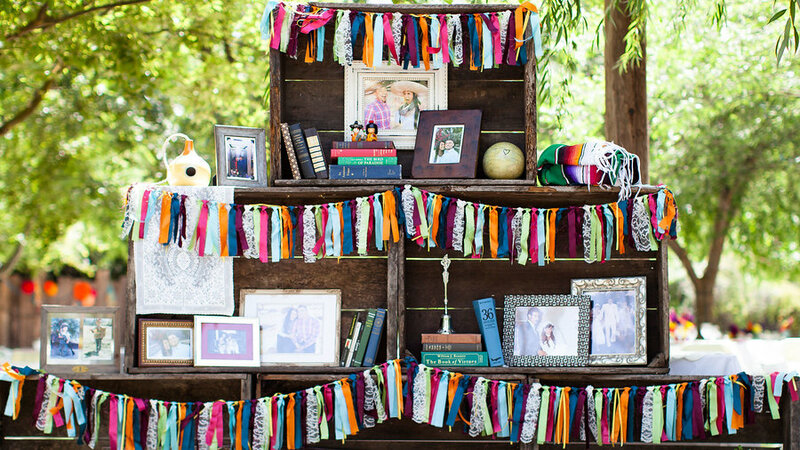 Commemorate your loved ones with a photo-focused altar. Adorn this special space with engagement photos, family portraits, and cultural knick-knacks as a symbolic gesture of weaving two worlds into one. Decorate this wooden showcase with everything from books and fabric to plants and bouquets. 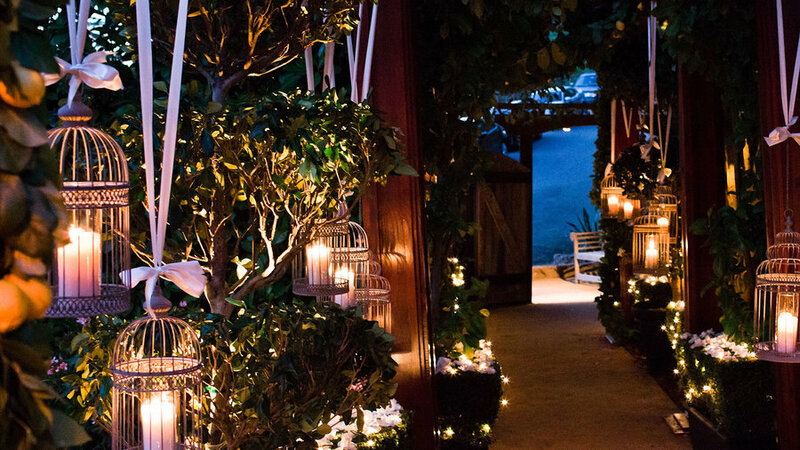 This French-themed wedding creates its own illuminated arboretum with a row of antique, candlelit birdcages. Engulfed with citrus trees and white blooms, this verdant walkway is transformed into an enchanted scene, guiding guests from the reception to a moonlit terrace. 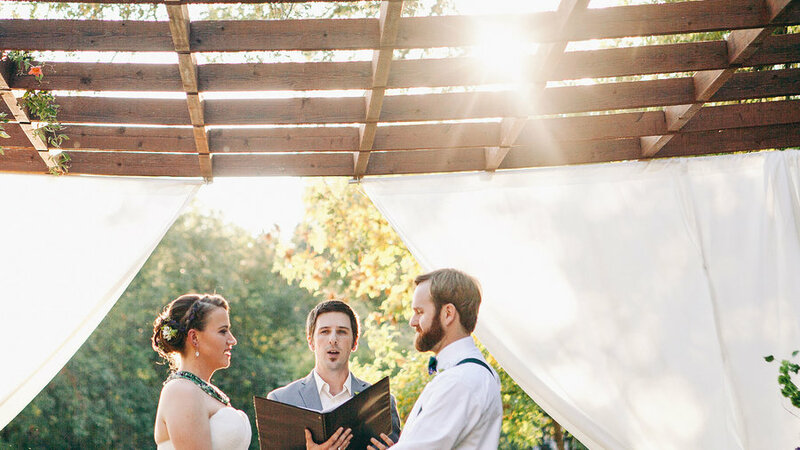 Dive into fall foliage with this autumn-inspired chuppah. This flower-studded frame complements the surrounding tower of trees with a lush combination of olive branches and bay leaves for form and structure, while orange amaranth (Amaranthus), dahlias, dates, persimmons, and Oncidium orchids fill the corners with color and texture. Those getting married on sweeping lawns or vast green scenes can create a focal point with a flower-studded chuppah. This stunning ceremony backdrop uses local branches as beams and combines lavish foliage and a range of garden roses to build an intimate nook amidst the grand grounds of the Menlo Circus Club. 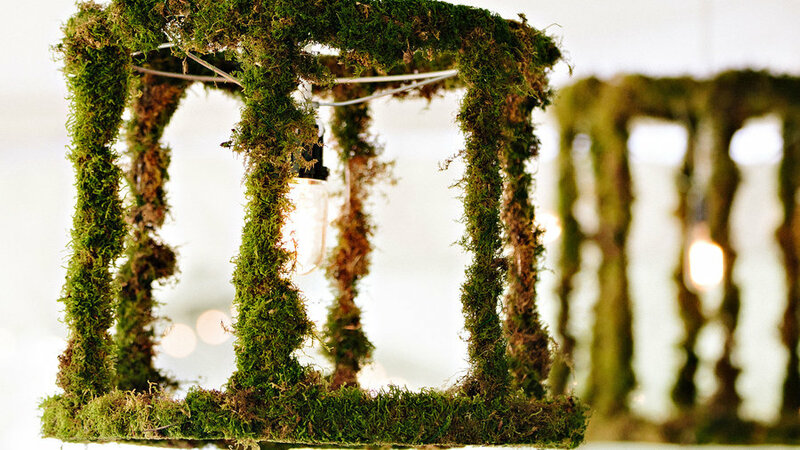 Add a little custom wedding décor by draping pint-size plants and succulents along railings. 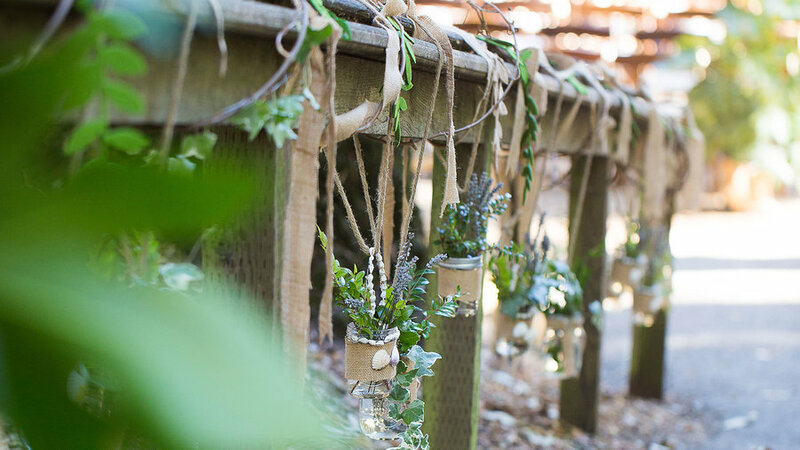 This Kings Mountain ceremony guides guests along a forest-bound pathway with handmade hanging planters embellished with seashells, matching the reception’s ocean theme. Simply recreate this concept with mini mason jars and twine filled with your favorite blooms. 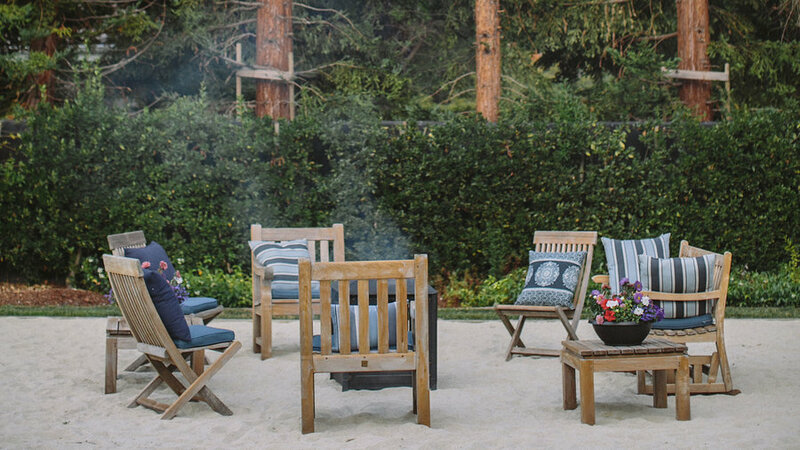 Keep guests warm and toasty with a glowing firepit and comfortable seating area. This concept works great with backyard weddings, and also serves as a functional space-filler. 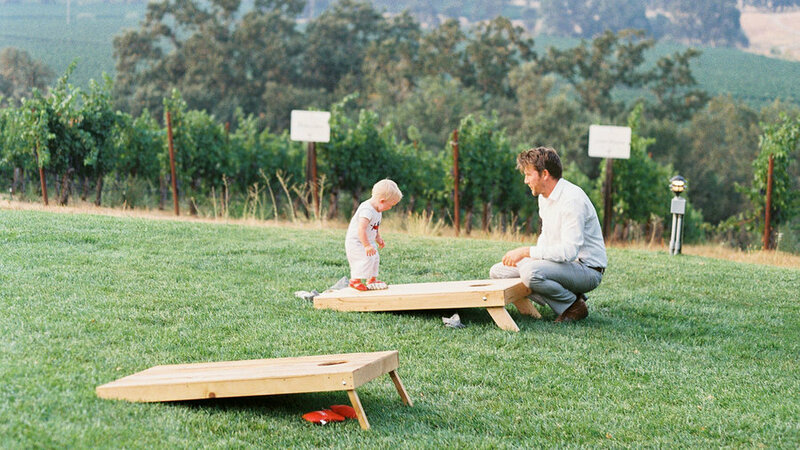 Indoor wedding receptions can also incorporate this idea on spacious patios with a portable firepit and fold-up chairs. 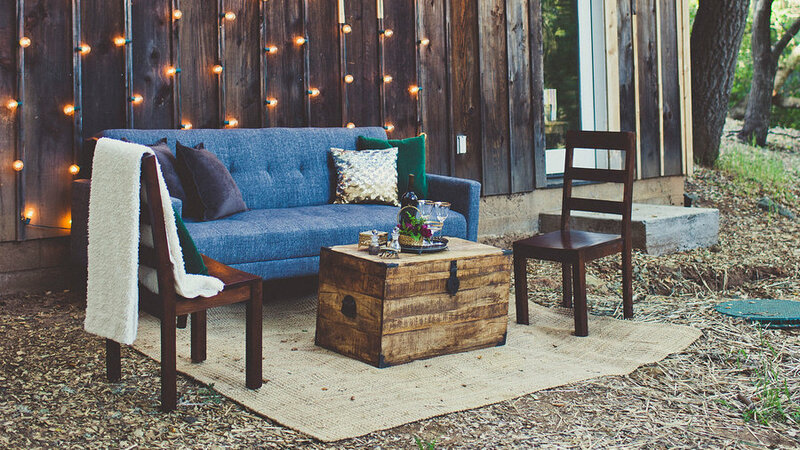 Create a cozy space for guests to unwind with a makeshift outdoor living room. Staying true to a countryside vibe, this tree-studded scene gives the wedding party the comfort of home within nature’s bounds. It also features a stream of amber Christmas lights, adding a personalized touch. Keep your guests refreshed with homemade fruit-infused drinks like watermelon water and strawberry-basil punch. This easy, DIY drink table adds fun colors and fresh tastes to the scene. Simply set jugs out on a self-serve table as a delicious, alcohol-free alternative. 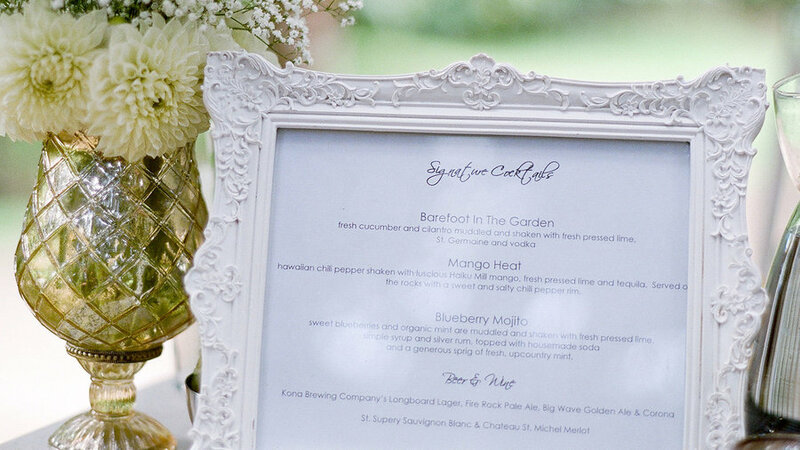 While many receptions feature individual meal cards, chalkboard menus have also become a resourceful way to relay dinner details. Outline the evening’s feast with paint markers and refinished wood, or use a mini chalkboard to showcase appetizers, salads, and entrees. 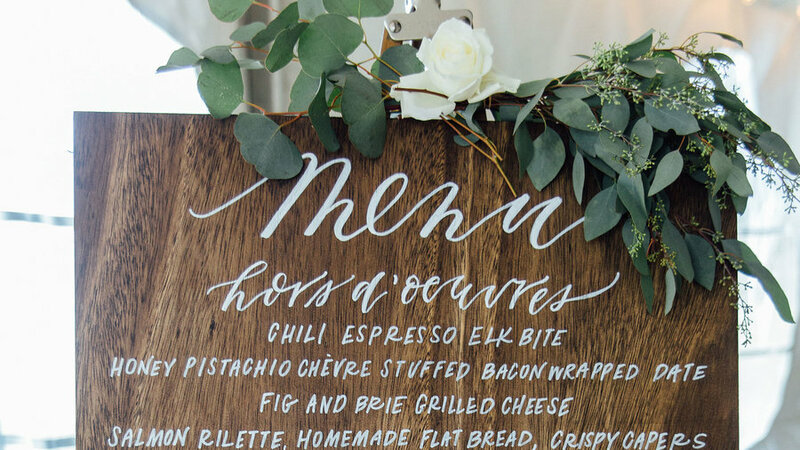 Prop the menu up with an easel and weave in your favorite foliage for an elegant, earthy look. Let man’s best friend lead the wedding party in style with a fashionable, flower-studded leash. 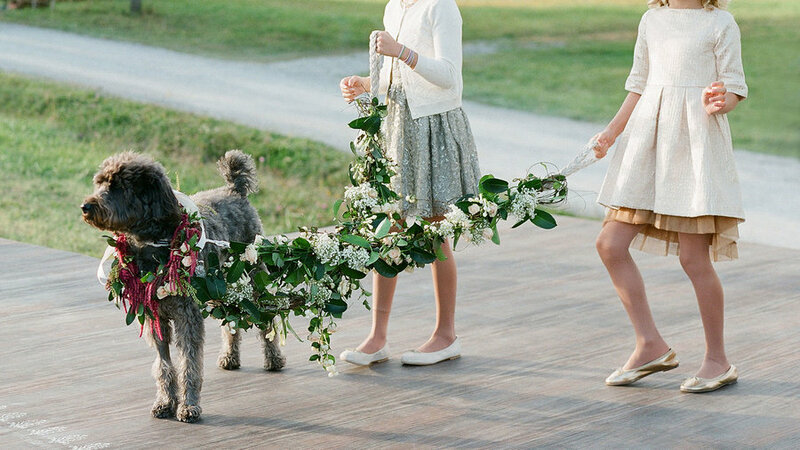 This inventive idea integrates furry friends into outdoor ceremonies, and offers adorable accents like a custom collar of amaranth (Amaranthus) alongside flower girls with a pair of matching flower crowns. Those getting married during fall or winter can bring in bits of the outdoors with potted trees and full flower arrangements. 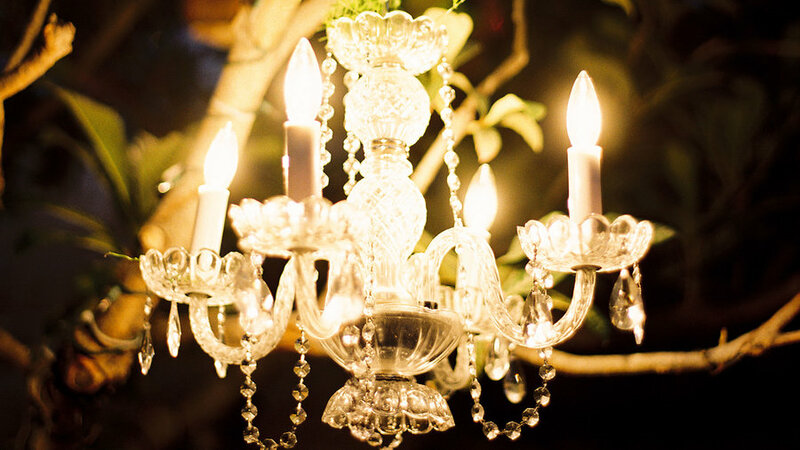 This elegant reception dangles crystal chandeliers and illuminated globes from above, creating a magical, romantic ambiance inside a spacious nursery. Getting married under the summer sun? 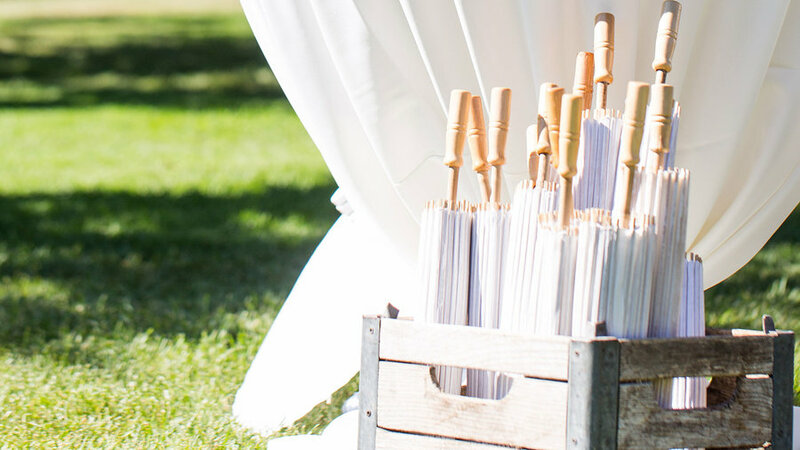 Shield your guests from harsh rays with these stylish parasols. Wedge a cluster alongside the entry, providing your party with a thoughtful shield. This idea not only double-duties as wedding décor, but also becomes especially handy in warmer climate regions stretching from Napa to Sedona. This rustic, repurposed bookshelf is a heartfelt tablescape filled with family photos and decorative foliage. Line your display with portraits of parents and grandparents as a simple way to acknowledge the long line of love that came before you. This stunning example accents the table with flower-stuffed mugs and votive candles, creating an illuminated photo collage. This greenhouse frame of vines and foliage becomes a private of room of sorts, housing everything from stone statues to regal planters overflowing with roses and amaranth (Amaranthus). 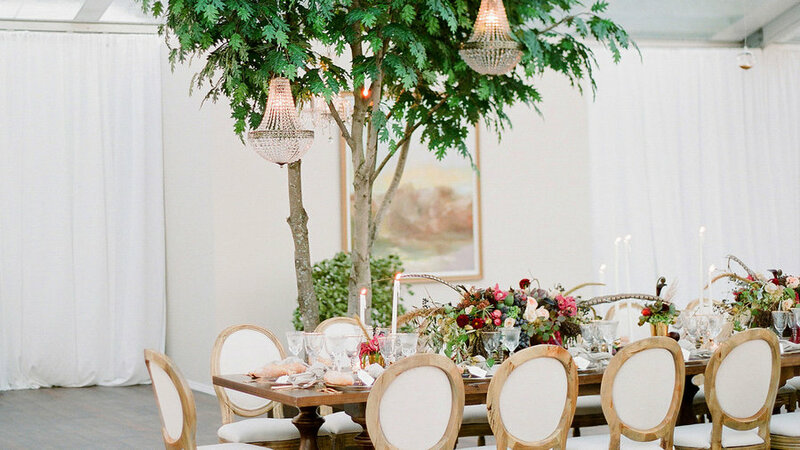 String elegance from tree-to-tree with classy chandeliers. Whether you're illuminating an outdoor dining area, a ceremony, or just setting the mood for an evening reception, this inventive idea effortlessly adds radiance and style to any tree-studded scene. Your guests will enjoy every second of the ceremony with cozy pillows and mini blankets. 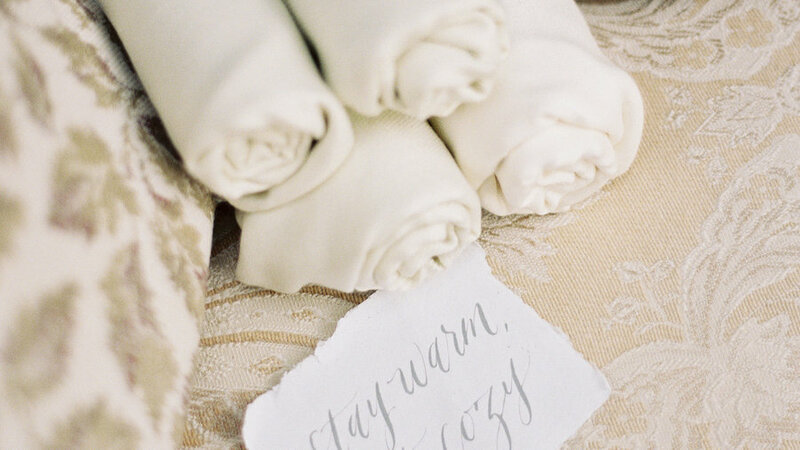 Evening outdoor weddings can get chilly, so add a little extra care and comfort with this considerate gesture. Simply set them at each seat or row in a basket for easy access. For those seeking an alternative to conventional, crystal chandeliers, think outside the box and into nature with these green cage fixtures. Constructed with ethically harvested Oregon sheet moss, this handmade artwork rounds out the rustic theme of a Northwest wedding. Stay true to a rustic theme with a hand-painted "Here Comes the Bride" wooden sign. This idea offers a bit of variation from the standard flower trail. 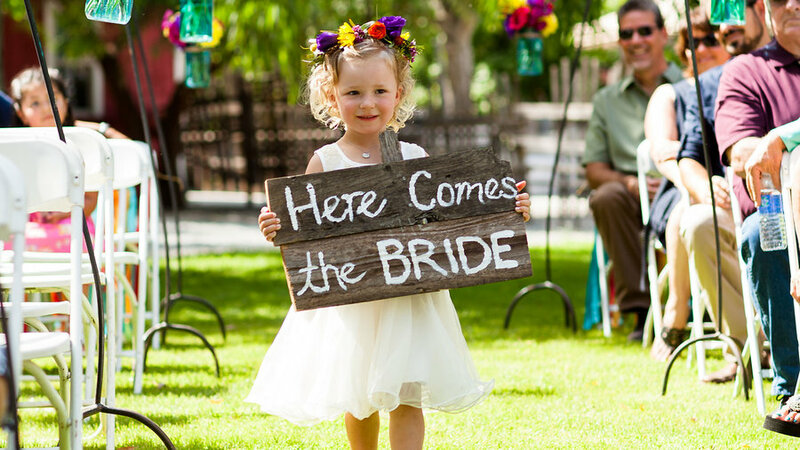 Those incorporating two flower girls into the ceremony can combine both concepts to create a truly memorable entry. 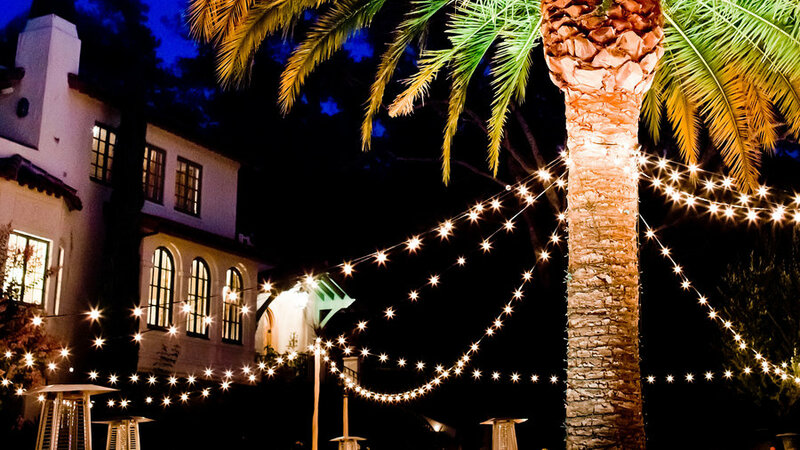 This Los Angeles outdoor wedding uses a fanning palm tree as an illuminated post, hanging iridescent string lights throughout the scene. This simple concept not only offsets the need for large, harsh lights, but also creates the perfect ambiance for a moonlit reception. 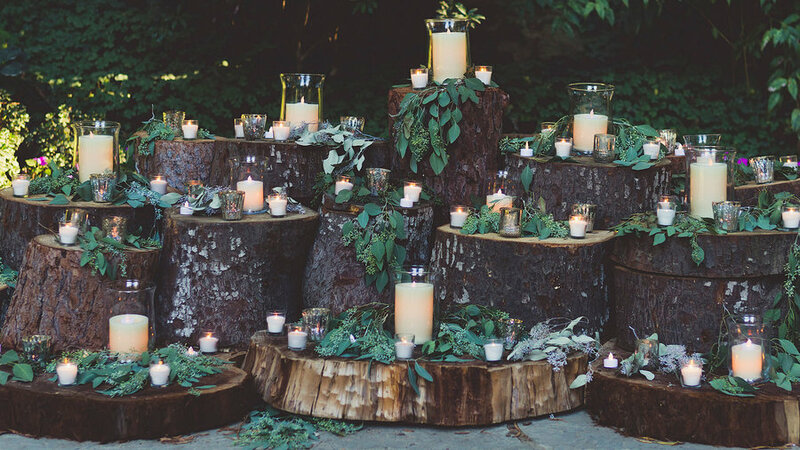 This Northern California wedding repurposes a series of tree trunks for a stunning candlelit display. 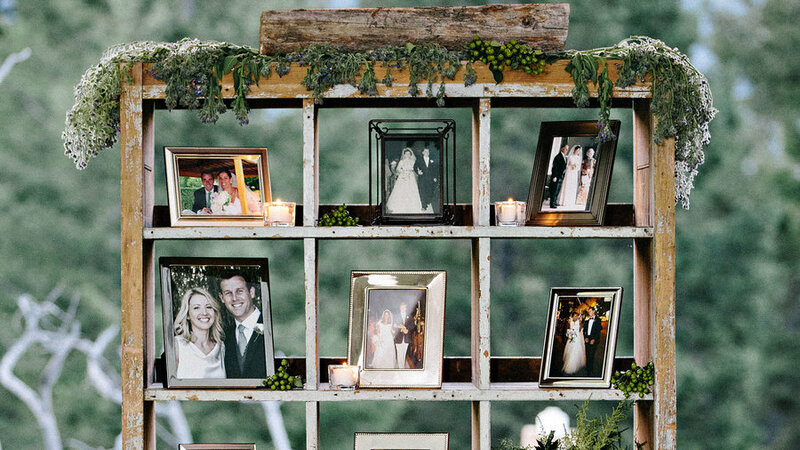 Replicate this concept as a ceremony backdrop or simply incorporate it as earthy décor. These crafty platforms do double-duty as entertainment for the little ones and a fun way to keep the whole party engaged. Those conjuring ideas for an entire wedding weekend can also weave this idea into pre- or post-ceremony activities. Sometimes a little fabric can go a long way. This flower-bedecked pergola and white canopy elegantly frame the lush ceremony grounds, forming a lovely scene to say, “I do.” Work with the venue’s natural vines and accent borders with fresh bouquets and flower arrangements. 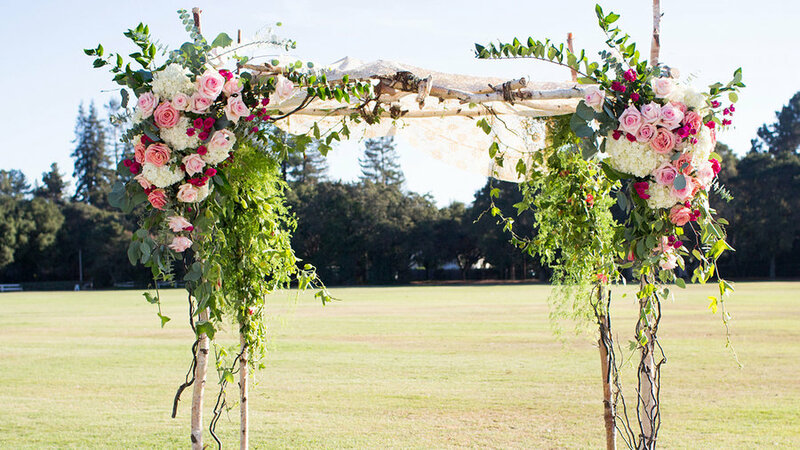 When it comes to outdoor weddings, a flower-studded archway can form a necessary focal point for spaces as vast as a meadow. 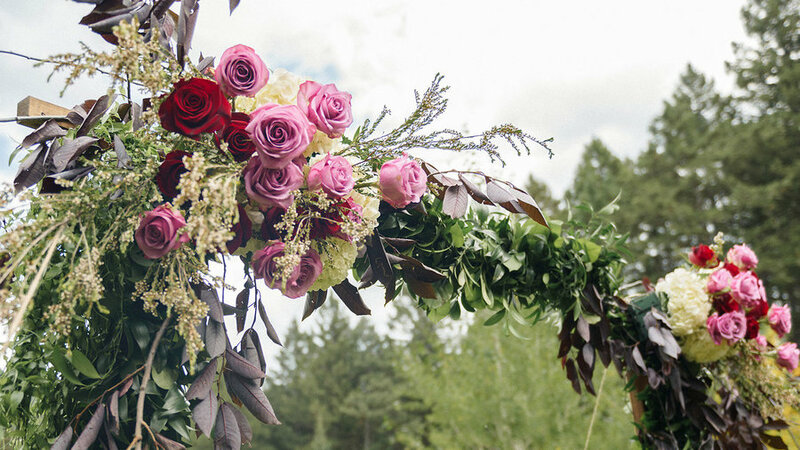 This Montana wedding features a beautiful gatepost with ‘Black Magic’ and ‘Lavender’ roses, local choke cherry branches (Prunus virginiana var. demissa), hydrangeas, and ruscus. 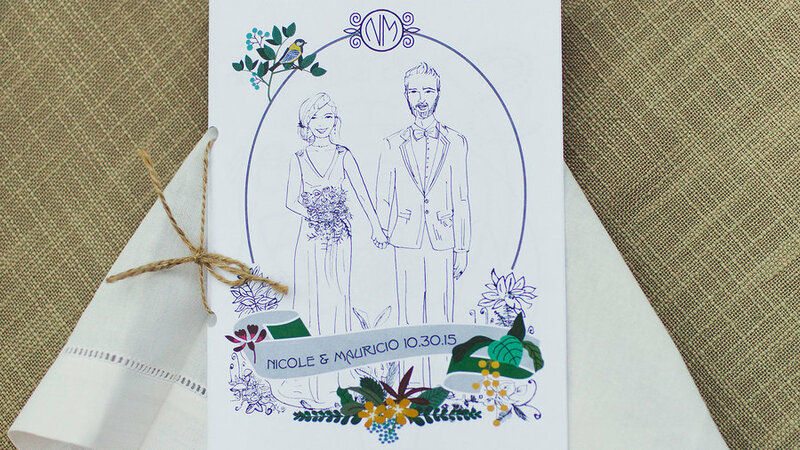 Add a little art to the big day with a custom coloring book. This pamphlet can host everything from sketches of the bride and groom to fun facts about where they met, or even doodles of a few coveted memories. As a bonus, this DIY idea also comes in handy when trying to keep the little ones entertained. This one is for the music lovers. Those brimming with enthusiasm for live bands or musicals can weave a little melody into the evening with a communal sing-a-long song. Invite guests to join in on the chorus of your first dance, creating a lasting memory that will forever sync with your favorite tune. 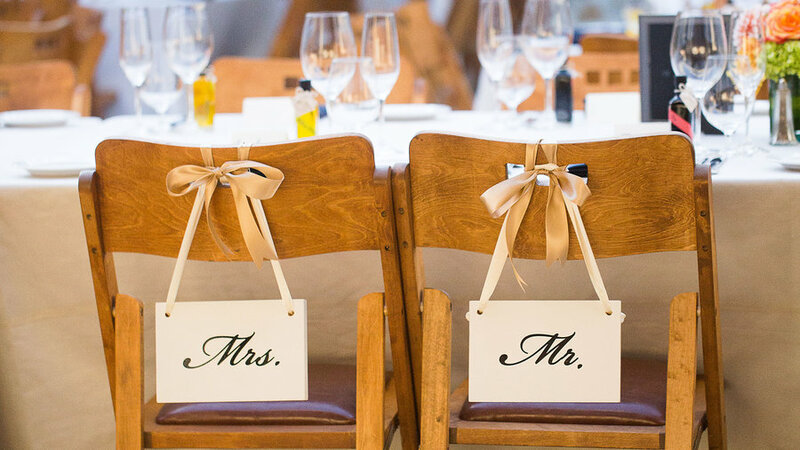 These his-and-hers chair placards are easy to recreate for any reception. Follow suit with wood cutouts, hearty cardstock, or even chalkboard squares. Add the finishing touch with bowed ribbons for a memorable photo-in-the-making. This bohemian ceremony sets the stage with a curtain of macramé and flowers, casting a beautiful backdrop for the wedding ceremony. Intertwined with peonies, roses, and ranunculus (R. asiaticus), this little detail makes a big difference. 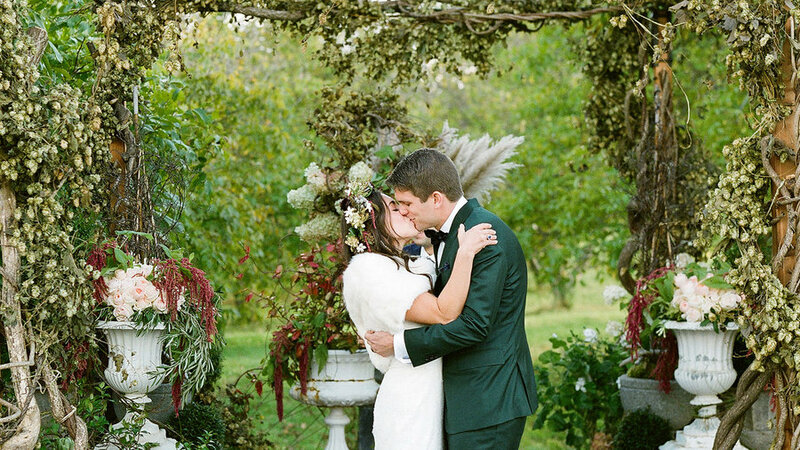 Its colorful decor complements the lush garden grounds and tree-studded setting. Remember those teenage days of engraving initials into hidden trees and tucked-away benches? Re-experience young love with these mini love logs. 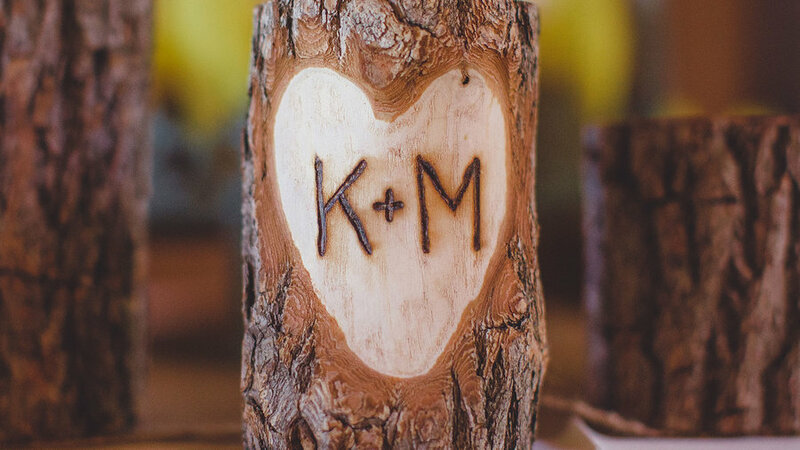 This DIY wedding decoration can be crafted from local, excess wood and engraved with a budget-friendly, wood-burning tool kit. 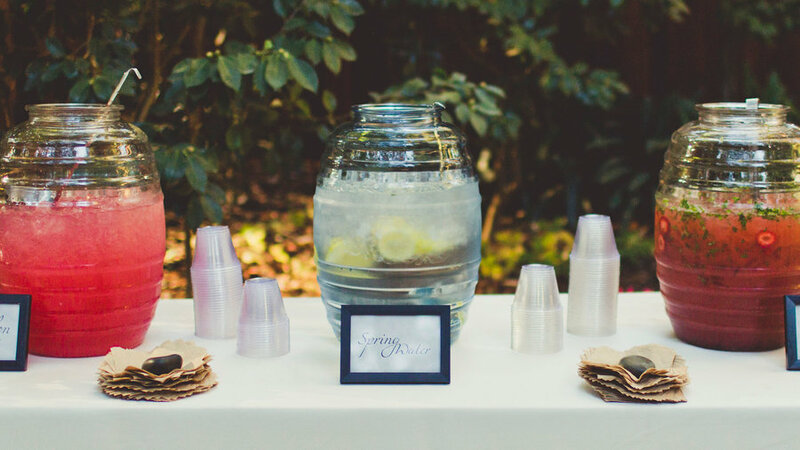 Select a few of your favorite drinks and give guests a taste of conventional favorites like wine spritzers and mojitos, or specific specialties crafted for your big day. Simply frame the details, place it on the bar, and let the fun begin. Ready to go a step beyond signature cocktails? Give your guests a taste of mixology with a cocktail infusion bar. 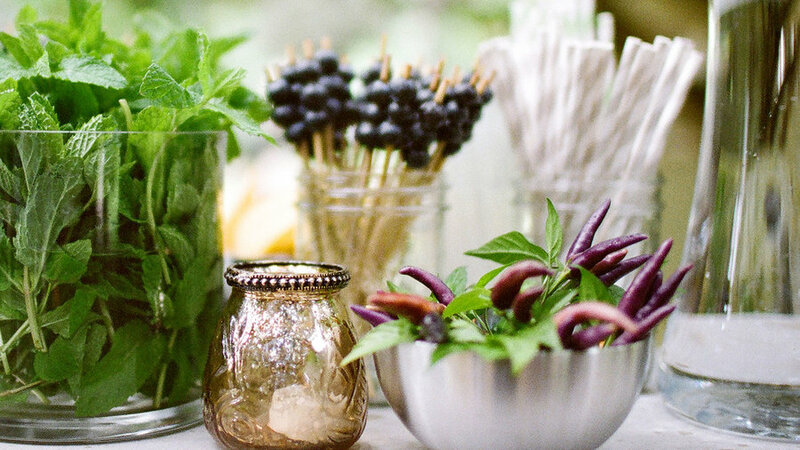 Set out jars of mint, peppers, and olive straws and invite guests to garnish their drinks as they please. This not only adds an interactive component to the reception, but also double-duties as a colorful wedding decoration. 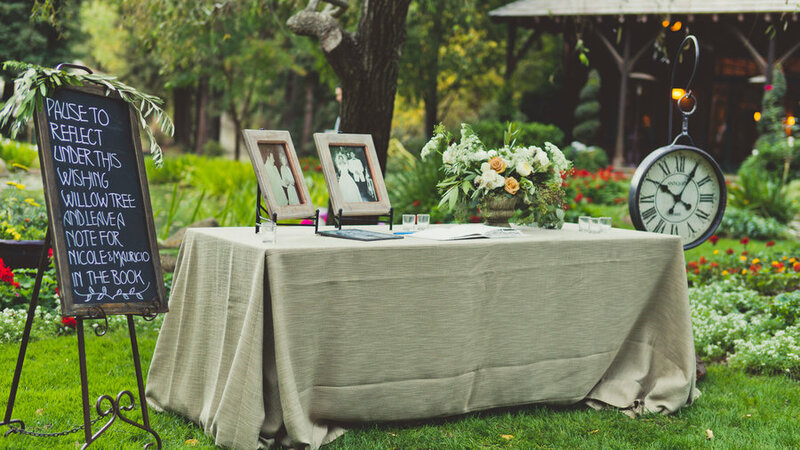 Outdoor weddings can make use of neighboring trees by choosing one as a reflection spot. This ‘wishing willow’ is bookended with a eucalyptus-studded chalkboard and an oversized clock, adding stylish accessories to the guestbook table. Add an extra something to your own scene with a blooming bouquet or a cluster of votive candles. Keep the little ones entertained with this activity bag. 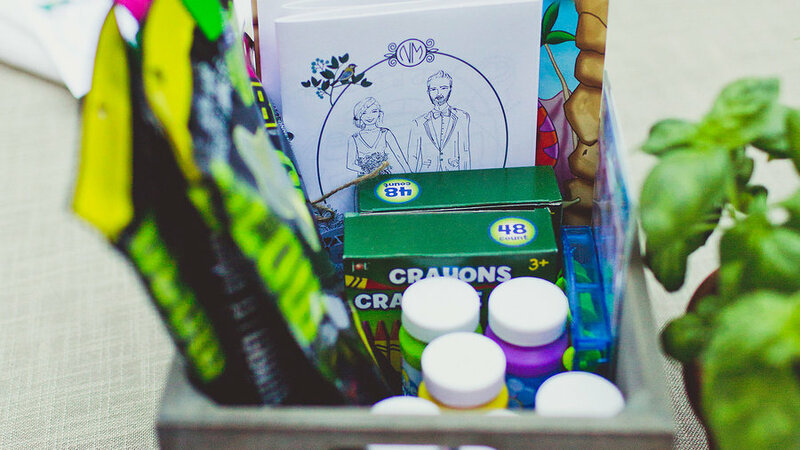 Fill a wooden crate with everything from bubbles and glow sticks to crayons and coloring books. Packed with entertaining to-dos, this DIY centerpiece makes a great accompaniment to any kids’ table. It’s halfway through the reception, the music is grooving, but those heels are hurting. Keep the dancing feet flowing with this thoughtful gesture. 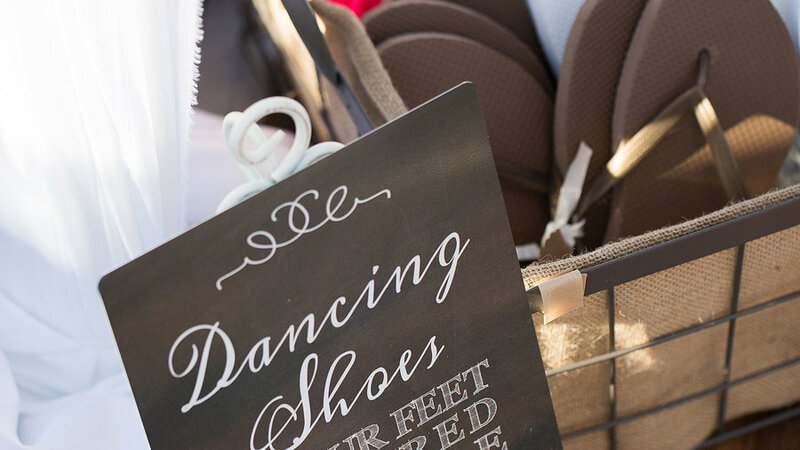 Lay a basket of flip-flops nearby and offer guests a bit of relief. This purposeful decoration not only shows that you’re thinking ahead, but also keeps the vibrant mood alive from beginning to end. 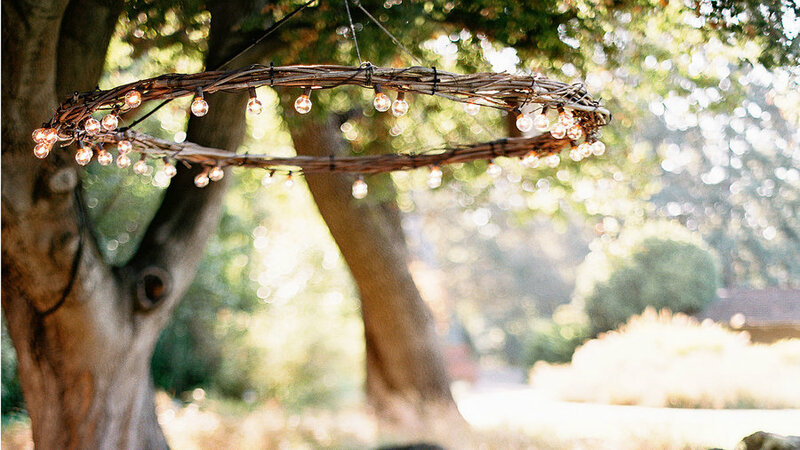 Transform prunings into a sparkling, rustic chandelier by bending soft wood like wisteria, stone fruit or elderberry branches into a wide circle, fastening your findings with floral wire and string lights. 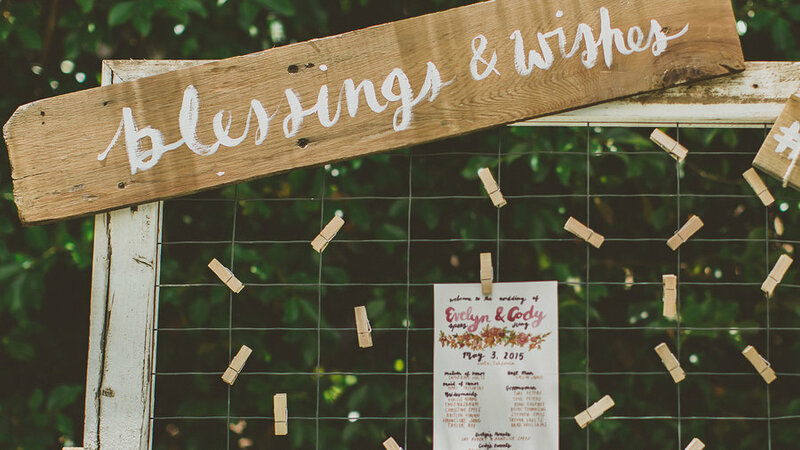 This DIY project can easily be hung from trees, adding a touch of homemade beauty to any outdoor wedding reception. 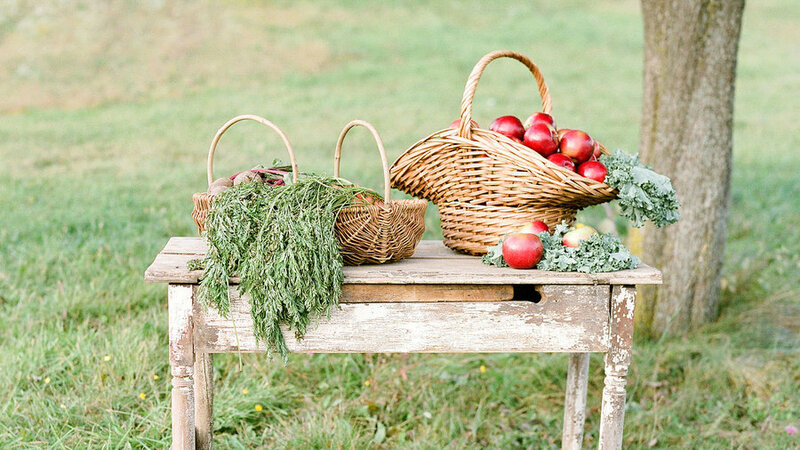 For those getting hitched in late summer or fall, add to nature’s bounty with overflowing fruit baskets filled with apples and a touch of greens. 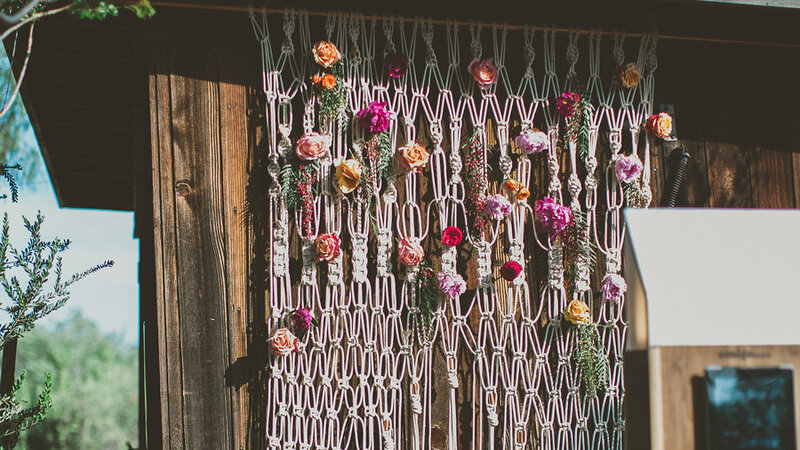 This unique wedding decoration adds a rustic touch and effortlessly aligns with brides and grooms getting married in barnyard settings, family orchards, or Napa vineyards. Nothing says “we’re hitched!” like a festive getaway car. 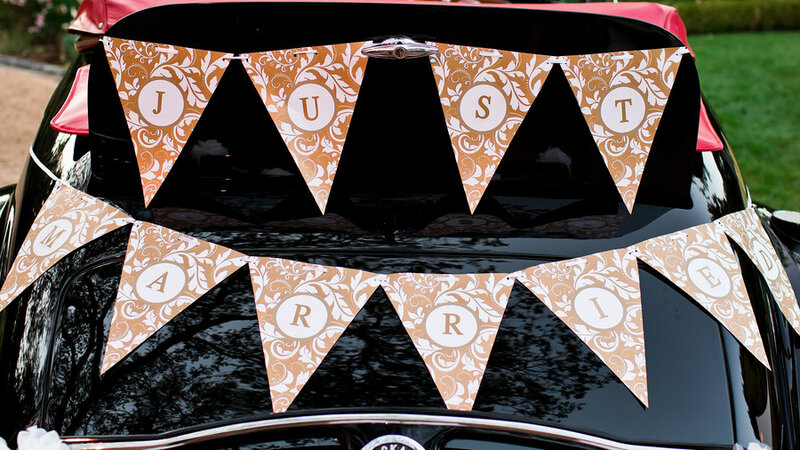 Whether or not you’re riding in this classy number, add a little décor to the rear of a vehicle, announcing your big day. Hang a banner across the back as shown, or make a nod to the past with a traditional cluster of cans ringing through the reception grounds. 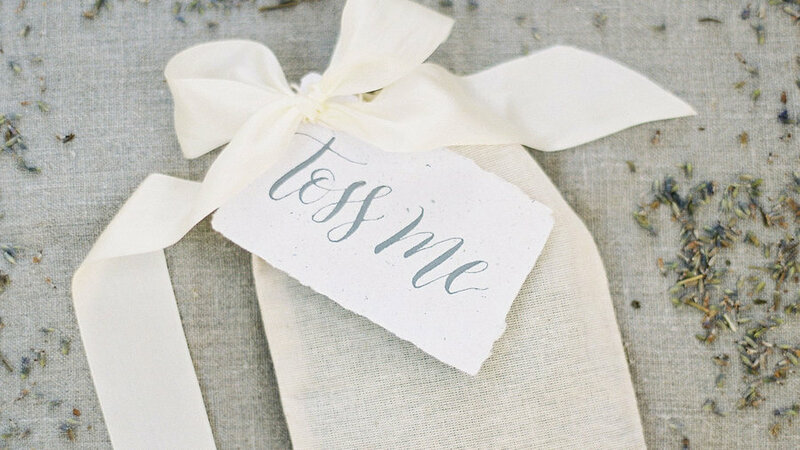 Circle back to a classic wedding tradition with these elegant, DIY rice baggies. Place ribbon-studded pouches at the entry of your ceremony or on each seat, and let guests send you off on your honeymoon with streams of rice and love. Interested in merging a bit of old and new? Fill your packet with clusters of flowers, dried herbs, or birdseed. This whimsical send-off caps the day’s celebrations with a tunnel of translucent orbs floating about. This not only makes a magical photo opportunity, but also lets adults and little ones partake in child-like fun. Нашел в интернете авторитетный сайт с информацией про карнизи для штор.